Pimachiowin Aki is 33,400 sq.km. of boreal forest and home to five First Nations that, together with the provinces of Manitoba and Ontario, are leading the nomination of the area as a Mixed Site (a site that is recognized for both natural and cultural values). First Nations of Pimachiowin Aki see themselves, and their cultural values, as intimately part of the natural values of the site. Because of their intimate relationship with the boreal forest, First Nations see their traditional lands as a cultural landscape, which in World Heritage terms are “the combined works of nature and humankind [that] express a long and intimate relationship between peoples and their natural environment”. During development of the original Pimachiowin Aki nomination First Nation partners expressed discomfort with the nomination process being split into separate descriptions and evaluations of natural and cultural values. Even with a Mixed Site, natural values are evaluated by the IUCN (International Union for the Conservation of Nature), from a largely science-based perspective, and cultural values are evaluated by ICOMOS (International Council on Monuments and Sites). Moreover, according to the 2015 Operational Guidelines for the Implementation of the World Heritage Convention, cultural landscapes are considered a form of Cultural Site (Annex 3, page 71). In principle, the cultural landscape concept does not apply to the natural values being nominated; in practice, the IUCN does take an active interest in cultural landscape nominations assessed by ICOMOS (see also, Linking Landscapes : Exploring the relationships between World Heritage cultural landscapes and IUCN protected areas). The IUCN and ICOMOS have also recently completed a project, Connecting Practices, through which they have discussed ways to develop a more integrated consideration of natural and cultural heritage. Although cultural and natural criteria have been merged, their use has not. Currently there is no way for properties to demonstrate within the current wording of the criteria, either that cultural systems are necessary to sustain the outstanding value of nature in a property, or that nature is imbued with cultural value in a property to a degree that is exceptional. Requests the World Heritage Centre, in consultation with the Advisory Bodies to examine options for changes to the criteria and/or to the Advisory Body evaluation process to address this issue and decides to include a debate on this item on the agenda of its 38th session. At the thirty-eighth session of the UNESCO World Heritage Committee (Doha, Qatar, June 15–25, 2014), Decision 38 COM 9B, Reflections on Processes for Mixed Nomination was adopted, recognizing that the Pimachiowin Aki nomination “raised fundamental questions” and requesting “the World Heritage Centre, IUCN and ICOMOS to prepare an updated joint report on this matter, including options for changes to the criteria and to the Advisory Body evaluation process for mixed nominations, for consideration by the World Heritage Committee at its 39th session in 2015” (see also the background report, “Reflections on Processes for Mixed Nominations” for more details). IUCN and ICOMOS should work together to provide coordinated advice during proposals for listing of a site on the Tentative Lists. Desk reviews of documentation should adopt a common approach and be shared between IUCN and ICOMOS. To the extent possible, IUCN and ICOMOS should seek to harmonize their field mission reports. IUCN and ICOMOS should conduct a joint briefing on results of field missions and desk reviews before finalizing their respective evaluations. At the thirty-ninth session in Bonn, Germany (June 28–July 8, 2015), Decision 39 COM 9B encouraged IUCN and ICOMOS to continue implementing the proposals of the “Progress Report on the Reflection on Processes for Mixed Nominations” and to report back on progress at the 41st session of the World Heritage Committee in 2017. Signs of improved communication between IUCN and ICOMOS were evident in the recent field mission, August 2015, during which a representative from each agency toured the Pimachiowin Aki site and met with First Nations and provincial planners. We’ll have to wait until the spring of 2016 to see IUCN and ICOMOS recommendations for inscription. IUCN, in collaboration with the State Party, First Nations, ICOMOS and others, was pleased to be able to contribute advice on the nomination in the full spirit of the World Heritage Convention’s upstream process, and in a dialogue that has involved at all stages the First Nations, local government and State Party experts. Despite, or perhaps because of the protracted evaluation process, this dialogue has advanced the thinking and evaluative practices of IUCN and ICOMOS concerning nominations of sites for their nature/culture interactions, and has been a catalyst for a renewed and growing joint approach to the links between nature and culture in the World Heritage Convention involving all of the Advisory Bodies, the World Heritage Centre and a growing range of partners. 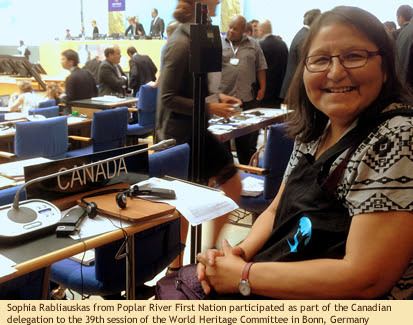 This is a legacy for the Convention from the nomination of Pimachiowin Aki that goes beyond the individual nomination concerned. The nomination also has a particular importance in the exemplary way it has come forward, via the State Party, as the initiative of the five First Nations. Its long-term significance for the work of the Convention lies also in its lessons about empowering indigenous peoples to determine their own priorities for conservation, which is of even greater relevance considering the adoption of the new Sustainable Development Policy and the recognition of the rights and role of indigenous peoples in the Convention’s Operational Guidelines.